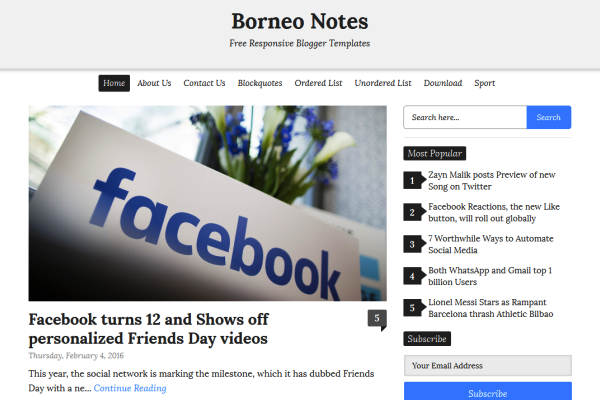 Borneo Notes is free responsive blogger template. Borneo Notes is a simple, clean, modern and professional blog ideal for making a professional blogging and elegant websites. This template is totally responsive so it adapts to your style as well as the device it’s viewed on. It is clean and fresh style and high user friendly blogger template. Borneo Notes created by Herdiansyah Hamzah and published on this site. Borneo Notes features include responsive design, smart thumbnail resize, label cloud edited, feedburner subscribe, search widget, page navigation number, popular post edited, 2 column layout, white color background, comment edited, standart SEO ready, share social media button on homepage/postpage and include important notes on template files. If you have question, please leave comment of contact us on themespaper [at] gmail.com. Terimakasih, semoga bermanfaat ya. Mohon maaf belum sempat menyelesaikan request template gallery-nya karena terbatas waktu. I would love to try this professional theme which looks like a well-managed launched website so it is ideally helpful for small online business owners as well as writers who are providing help with assignments UK and helping students and educators by sharing academic tips through blogger and through another blogging platforms. I will sure share this theme updates with my friends who are passionate about using something new. Let’s see what their opinion on it. Wow, really simple and faster loading templates. Thank you anonymus, hope you enjoyed. Do not forget to share this template for everyone. Hi, very nice template. Any chances that you will share theme which you are using here on any similar to this? Also please make a gird template for books. These kinds of blogger templates are very hard to find and old. Thank you, i'll try to make a grid template as soon as posible. How to remove No Image from Home page and show only title on Homepage, as in my blog Posts are without Image. I've been answear via email, please check your inbox. Thank you. What could I do to fix it? Thanks so much! Mas, template blog ini sudah saya publikasikan di blog saya. Ada yang kurang sebenarnya, yakni dibagian Related Posts.